Immediately distinguished by the direct mono sound and you're-either-with-us-or-against-us messages of the landmark title track, Bob Dylan's The Times They Are A Changin' sounds an unmistakable clarion call on behalf of progress and its unstoppable advancement. The reverential 1964 album feeds off the opening tune and its unmistakable sentiments, marching forward to confront racism, poverty, injustice, and upheaval in a stark, immediate manner. Mastered from the original master tapes and presented on Hybrid Mono SACD, our version delivers the landscape-shifting music in reference-quality mono sound that transports you to Columbia's Studio A. Reflecting the austerity of the topics and Dylan's mood, the sonics are direct and unadorned-each word hitting with weight, each phrase lingering until it pulls you under, each storyline echoing as fact. 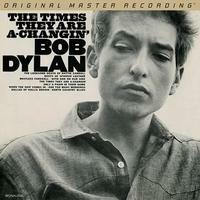 As the preferred mix at the time of the recording, the mono version presents Dylan as he and his producers originally intended. Since the separation of the stereo versions isn't as sharp, the mono edition places Dylan's vocals in the heart of the musical action and as one with the accompaniment. It paints listeners an incredibly accurate portrait of the attention-getting, concrete mass of sound that features no artificial panning and straight-ahead immersion into the music. This is how almost everyone first heard this timeless album-making the mono mix all the more historically valuable and truthful.